Offering a milder version than the Macanudo Café line, Macanudo Gold Label brings the lighter side of a hand-rolled premium cigar to each of its users. Macanudo Gold only uses the finest Dominican Piloto Cubano & Mexican fillers with a Mexican San Andrean binder. The makers at Macanudo combine all these amazing ingredients together under a US Connecticut shade that uses only the 1st & 2nd priming leaves, allowing these wrappers to ripen to a golden patina with a naturally sweet taste. Once ignited, these handmade cigars offer a slightly sweet, mild bodied smoke with a light mellow flavor that’s nothing short of remarkable. 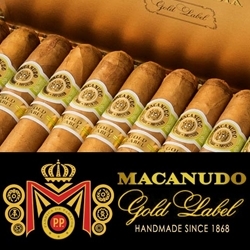 Macanudo Gold Label cigars are available in varieties of sizes and flavors listed below. Each of these styles are available today for a discount price! Call us for more details!